Learn how to master Big Data and unlock the potential benefits for your organization. 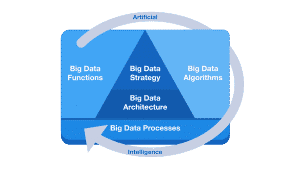 This training is based on the Big Data Framework, a framework designed to provide a strong understanding of the fundamental concepts and theories of big data technologies and tools. The framework is a vendor neutral approach to Big Data, describing six core capabilities required of an organization to improve Big Data proficiency. The Enterprise Big Data Professional training and certification is derived from the Big Data Framework. This 3 day Enterprise Big Data Professional training and certification is fast gaining international recognition. The training and certification scheme is accredited by APMG International, a global leading and independent training and certification accreditation body. This training aims to provide a working knowledge of the fundamental concepts and theories of big data technologies and tools, enabling individuals and their organization to enhance and realise value from big data. The training provides an overview of existing technologies, but does not include programming. All participants will receive an e-copy of the Enterprise Big Data Professional guide. The Enterprise Big Data Professional (EBDP) qualification assess an individual’s understanding of the Big Data Framework as well as key data processing techniques and algorithms to solve big data challenges. There is no mandatory prerequisite for the Enterprise Big Data Professional qualification. The Big Data Framework training and certification scheme is designed for individuals seeking a working knowledge of the principles supporting Big Data, big data capabilities required of an organisation, and wanting to be proficient in analytical practices and technological concepts of a contemporary Big Data environment. HiLogic can also provide corporate in-house training at any location across Australia.